If you're looking for a bean bag chair, you might be concerned about the harmful pesticides used on non-organic cotton varieties and the chemicals that go into furniture making. 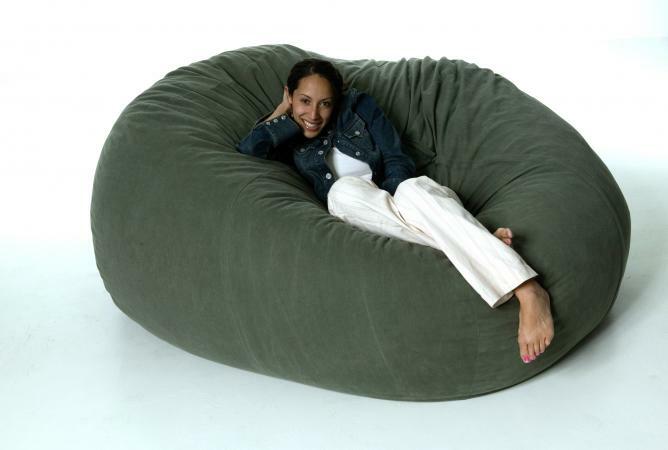 Searching for bean bag chairs that are natural or organic is challenging, however. There are only a couple of online retailers that offer a 100 percent natural product. Bean Products offers their Comfy bean bag chairs in eco-friendly organic cotton, organic cotton, or hemp. If you choose hemp, your color choice is natural or black. Organic cotton chairs are 80" in circumference and available in blue, tomato, avocado green, pink, sweet potato, plum, navy, hibiscus, black, or natural. Each chair costs about $90. To make the chair all-natural, you must upgrade to natural latex filling for $50 extra. A personalized message may be embroidered for $20. The Big Bean chair is available with natural latex filling. It's 130" in circumference. Colors available in organic cotton are cobalt blue, tomato, avocado, black, hibiscus, navy, pink, and natural. Hemp cover choices are natural and black. Organic cotton chairs cost about $150; hemp chairs are around $160. Most bean bag chairs are refillable. If you already have a natural cover, organic buckwheat hull fill is available in 10-pound bags for about $22. Three pounds of organic latex foam fill is also available for about $36. Depending on the size of your chair, you may need multiple bags. An organic or natural chair is typically made from pesticide-free cotton or hemp and free of harmful chemicals or fabric dyes. There are several benefits to these green furniture alternatives. Organic bean bag chair covers are often hypoallergenic and may reduce the risk of allergies. Bean bag chairs usually include a washable cover. Regularly washing the cover can help prevent allergens and bacteria from building up in the fabric. It's also a great way to remove stains and to keep your furniture looking good as new for a long time. Organic products are good for the earth. By supporting organic growers, you are helping sustain a system of organic growing that can prevent dangerous chemicals from seeping into water supplies and may reduce factory emissions. Some bean bag furniture is filled with reconditioned, shredded products that would otherwise take up room in already-full landfills. It's a great way to recycle and reuse! Bean bag chairs make great family loungers and provide relaxing conversation areas. You and your family will undoubtedly spend countless hours unwinding in whatever chair you choose. When you buy a chair made from organic and/or natural materials free of potentially dangerous toxins, you're helping to protect your family's health and the environment.